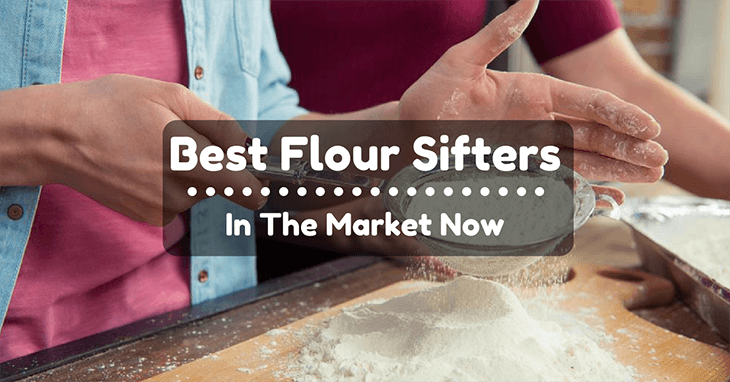 →5 Best Flour Sifters In The Market Now and #1 Is Already A Winner! Why Is There A Need To Sift Flour? 2. To Allow The Process of Mixing To Be Evener. 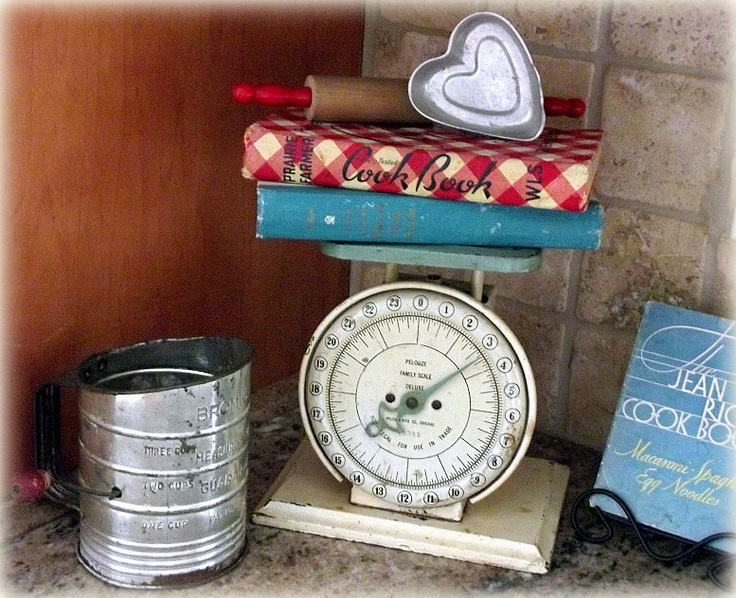 Do You Ever Really Need A Flour Sifter? Most bakeries, especially the more professional ones, utilize scales so they could weigh the ingredients since flours that are packaged are known to be uneven regarding its distribution. As most of us would prefer measuring flour with our cups, we often forget that this is done just for convenience’s sake and not for accuracy. In this regard, sifting is not only necessary but should also do you good to your output in the long run. Apart from its uneven nature when you take it out of the bag, sifting is also a must as it may cause some issues with mixing once it remains unsifted. When you sift, it should provide you an even texture to the powder, allowing the liquid to a smooth integration. It doesn’t only lighten it, but as what we’ve already covered on the second one, this allows for a much quicker amalgamation of fluids in which the reduction is highly likely regarding over-mixing and the toughening of your biscuit output. As the question dictates, this all boils down to your decision. But as for me who is quite particular with how my flour appears or how my recipe requires it to be done, owning a flour sifter is a godsend. However, for those who may not opt to have one, sifting may be done using a sieve or a strainer. Just put the flour right into the sieve and shake it back and forth until your preference is achieved. This method is very much akin to using a flour sifter. Meanwhile, you may also sift the flour by simply putting it into the food processor. After that, Buzz it for at least two to three times. Now, if you have small quantities, this second method can be especially effective. As flour sifters are beneficial for those who do many baking sessions, the same couldn’t be said to those who just bake periodically. 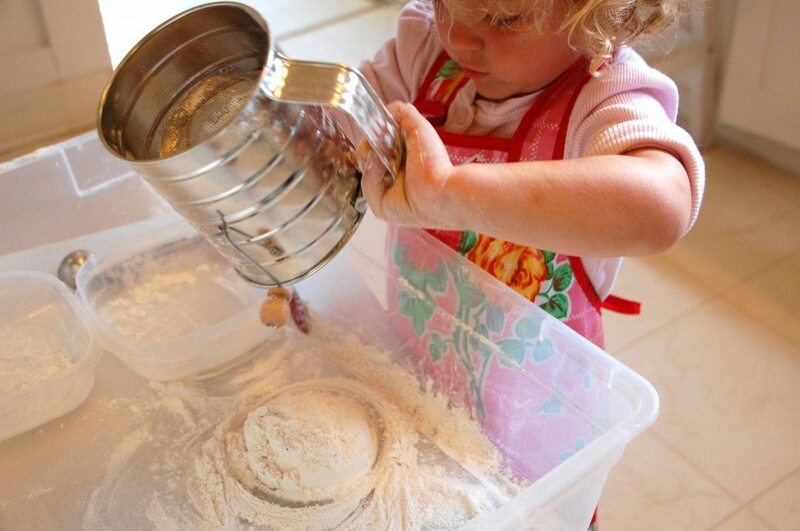 Also, flour sifters are quite difficult to tidy up, and they consume a large amount of cabinet space. In this section, we’ll not only disclose some of the key considerations that you have to remember before you purchase a flour sifter, but we’ll also briefly discuss some of the best types of sifters that should work well for your baking endeavors. This is especially suited for those who deal with recipes that require a significant amount of flour to be sifted. When you get to have a flour sifter that does it with a larger capacity, that entails that more ingredients get to be sifted without hurting your arms or dealing with it for a period. All flour sifters have the ability to sift from one to five cups. While this will also depend upon your personal choice, your flour sifter should always be durable. However, when you factor in style in durability, you might have to decide a little bit more consciously. 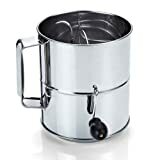 The pro-style stainless flour sifters may look aesthetically-pleasing, but most of them weight heavier than other types. This should wear your arms out eventually and might irk you in no time especially when sifting vast amount of flour. Meanwhile, the lighter weight, metal variants are mostly made of tin or pot metal which may lead to rusting. To avoid these scenarios, go for light, stainless steel types. Even the plastic versions will do as long as they are of high-quality materials and are heavy-weighted. It’s not only safe to get to own those products that are easy to use, but they should also make you the practical one. Apart from comfort, you’ll get to enjoy using them. Go for the traditional, crank-style models which are built with comfy handles that will aid you in cranking them smoothly. The more traditional ones without the comfortable handles will require you with some energy just to turn a handle. In this respect, I’d highly recommend those that are also easy to clean. Lightweight ones are also preferred with a light spring. Heavy springs are tested to wear your energy out once it is repeatedly used. Veer away from multi-sift models as they are notorious for being difficult to clean. With measurement marks on your sifter, your guesswork regarding the accurate measures of flour won’t have to be an issue. Choose items with volume markings that can be seen on both inside and outside. This should help you save time on flour measurement right before you sift them. On the other hand, stamped marks or numbers are more preferred as they won’t fade over time and use. If there is a product that exemplifies virtually everything that we have discussed in the previous section, this section might be the perfect ad for this. And as it goes, its features are on point, relevant, and indeed useful. It comes with a durable & lightweight sifter that can hold a full 3 cups, making your home baking needs a lot easier! It also has a classic and reliable hand crank along with a single mesh that can withstand repeated use without having to tire your hands out. Meanwhile, the product’s double loop agitator should leave you nothing behind as soon as everything is done. The Bellemain’s contender just cranks it smoothly. 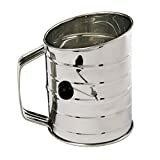 This flour sifter may be old-fashioned, but its overall classic form and quality construction are what make this next entry quite formidable among its rivals. It boasts of a stainless steel structure that has a capacity of 3C/24oz. It has a simple design that may very well please those who’ll use it. Meanwhile, it has two wire agitators that assure you that this product won’t leave any wasted flour! Norpro’s is likewise ideal for desserts such as cakes that feature light and delicate texture. 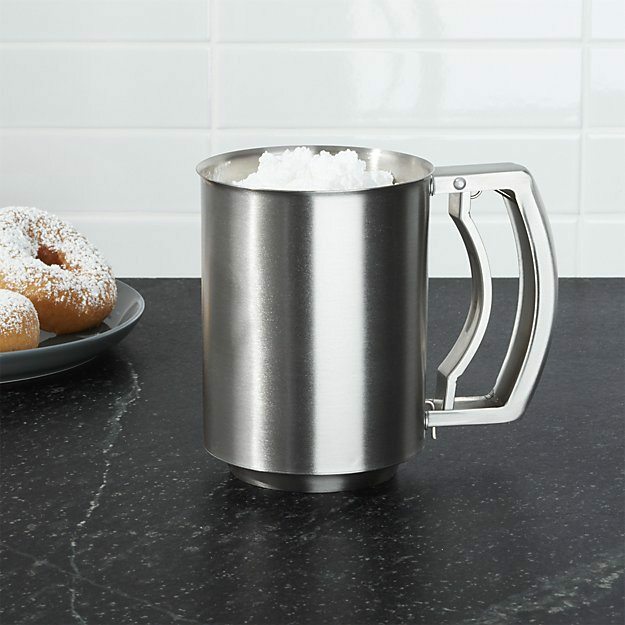 This can also be used for flouring your work surface or giving your food a light dusting of powdered sugar. Essentially, your work here is a breeze as the product itself is easy-to-use! Just add your ingredients, crank it up, and you’re all set. 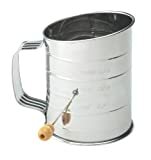 Mrs. Anderson’s Baking Crank Flour Sifter is not only ideal for disintegrating clumps but should also work for aerating flour along with icing sugar and other sifted baking ingredients. And as it is made from stainless steel and with a wood knob handle, your product should be reliably sturdy, durable and rust-resistant. Now onto its primary function, this entry should fluff your powdered ingredients for lighter baked goods. It should also help in blending your salt, baking soda, and baking powder — all of which results in an even more consistent and better taste. Your task of sifting flour will no longer be tedious with this product from OXO as it is specially developed to make that procedure easier and faster. Sifting is rendered quite quickly, just add flour and shake the tool gently from side to side. On the other hand, its top and bottom lids are designed to keep your flour fresh while tidying up the cupboard’s inside. OXO’s only contender also features the proprietary Good Grips soft handle that should make your experience more comfortable. The product is likewise top rack dishwasher-safe. This Cook N Home Stainless Steel entry just doesn’t shy away from delivering its function with a huge punch. It comes with a huge 8-cup capacity that should be ideal for your most baking aspirations. It is also equipped with an equally sturdy stainless steel construction that gives this product an extra durability. Moreover, its stainless steel form has a mesh screen and wire agitator that is both reliable and easy to operate. The same can be said with its crank handle that won’t leave you fretting over when cleaning it as it is designed without much complication. 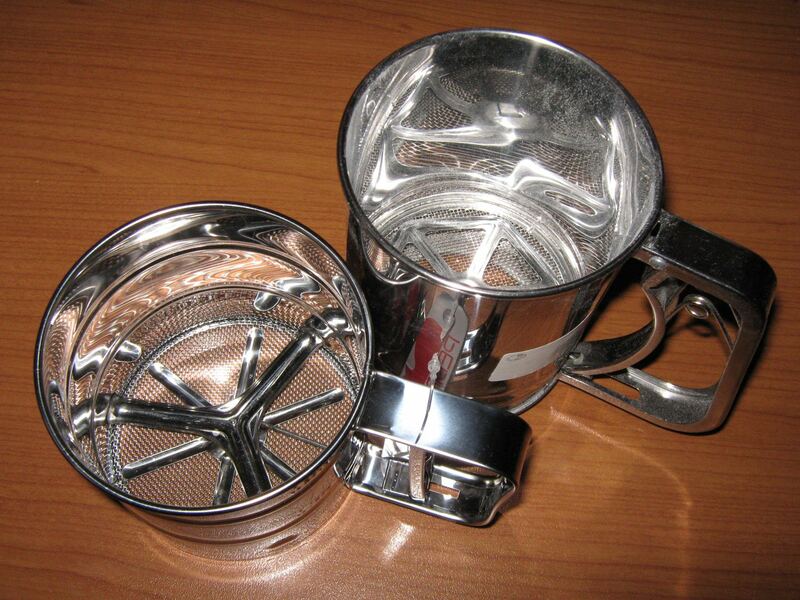 The Bellemain Stainless Steel 3 Cup Flour Sifter is triumphant in this competition. It all has the features of what a flour sifter should have. No ambitious add-ons, just the necessary components that are both reliable and efficient. From its lightweight form, effective hand crank and single mesh, right down to its double loop agitator, this product just outpaces its rivals. The entries above are all winning in their ways; it would still be all up to you which of them should suit your needs well. Whatever your choice is, ensure that it meets all the key factors that we have outlined in the previous section. If you think I’ve missed on a product that deserves a spot on our list or you just want to share your experience with your flour sifter, feel free to sound them off in the comment section below! Until then, happy sifting!